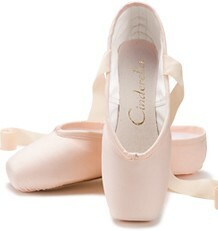 Now that I have tried the Grishko Elite, I can understand why so many dancers like Grishko pointe shoes. I find them to be very well made. 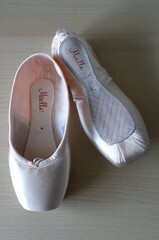 The Fouette is another model in Grishko’s collection that is suitable for those with short toes and wider feet. In my opinion the Fouette has a prettier aesthetic than the Elite. 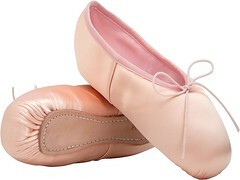 The Fouette with a medium shank is one of Grishko’s most popular models. I am very tempted to try a hard Grishko shank just to see how hard they really are. Since the Fouette is a releve model, roll through might be a bit challenging. One day soon, I need to contact Grishko and ask them why all their pointe shoe models show a nail in the middle of the insole. Is there a reason the nail is left visible? Could it be that the nail can be removed to loosen the shank for more flexibility? Or will pulling the nail cause the shoe to fall apart? *Grishko states that the nail cannot be removed. 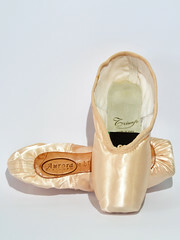 It holds the inner sole and shank together. 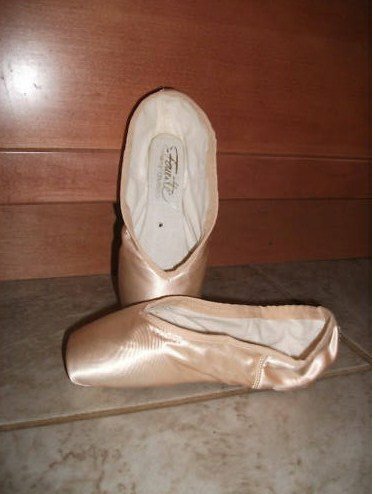 This entry was posted in Pointe Shoe Images and tagged cameo, Grishko, Grishko Fouette, Pointe Shoe Brands, Pointe Shoe Images, Pointe Shoe Tips. Bookmark the permalink. 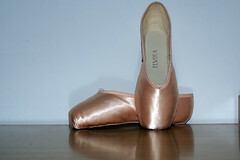 Hi, I have a doubt, is the Elite is for wider feet, how come the Fouette can work for wide feet too? If you take a pair of Elites and a pair Fouettes and place them side by side flat on the floor you will notice that from the side-view the toe box height or profile of the Elite is almost as flat as a pancake. 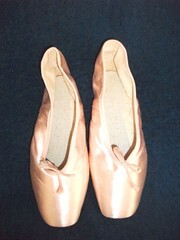 The Fouette toe box profile is higher. Two pointe shoe models can both be wide across, but the dancer that has “meat” on her instep will need a higher profile box to be able to point her toes downward.. 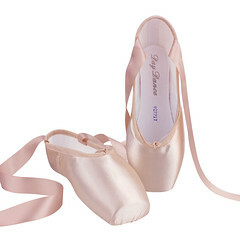 Almost all pointe shoe manufacturers offer wider versions of many different styles. Hi! Have you tried their super-hard shank? I have a pair of Grishko 2007 Pros with super-hard shank – it’s so hard that it’s difficult to break in even using hands! I think these will actually last for a long time!